We offer specialized classes to anyone who is interested in scuba diving regardless of disability. Classes include group classroom instruction and private 1-on-1 pool sessions with the instructor. The pool is fully ADA-compliant with a mechanical chair available to help the student get into and out of the water safely. Once in the water, the student is taught the scuba skills necessary to begin the journey to underwater freedom. Please look at NEWSDAY article, from September 14, 2008, about handicapped diving instruction at Scuba Network, Long Island. Classroom sessions consist of a comprehensive lecture series required to complete your training. 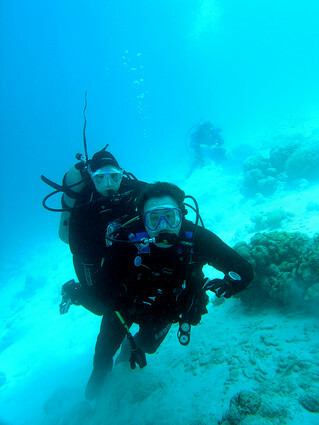 Scuba Network® offers an atmosphere of fun and knowledge, which makes your required attendance easy. A DVD is required to supplement those sessions. Experience the excitement as you learn to breathe underwater in a controlled setting, before going into the ocean. Four open water dives and a snorkeling dive, with an instructor, are required to complete your certification process.